KARACHI: Higher cotton yarn off-take ahead of Ramazan forced textile spinners to replenish stocks on Friday. Overall trading remained brisk, with good quality lint and average cotton lots picked up readily by spinners. Power looms are currently operating at a full capacity to meet fabric demand ahead of Ramazan and Eidul Fitr. Massive devaluation of the rupee against the dollar has lowered local cotton prices as compared to imports of the commodity. Leading spinners to get hold of big lot deals but failed as many ginners showed little interest in disposing stocks knowing that there is a short supply of cotton prices may go higher. The world leading cotton markets including New York cotton generally remained easy on lower export figures. 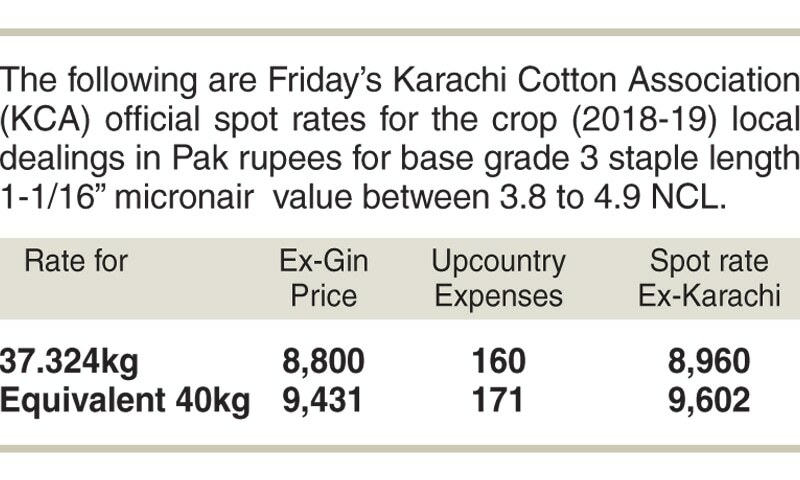 The Karachi Cotton Association (KCA) spot rates were steady at overnight level at Rs8,800 per maund. The following deals were reported to have changed hands on ready counter: 900 bales, station Ghotki, at Rs8,900-9,000; 400 bales, Khanpur Maher, at Rs9,000; 400 bales, Sanghar, at Rs7,750; 1,000 bales, Rahim Yar Khan, at Rs8,900-9,000; 600 bales , Khanpur, at Rs8,950; 400 bales, Hasilpur, at Rs8,725; 634 bales, Noorpur Nauranga, at Rs8,375; and 200 bales, Adilpur, at Rs8,800. All of Textiles © 2017-20. All Rights Reserved.